We've heard of turning yesterday's lunch into tomorrow's electricity, but a new energy converter coming out of Oak Ridge National Laboratory harnesses the power of a different type of hot waste. 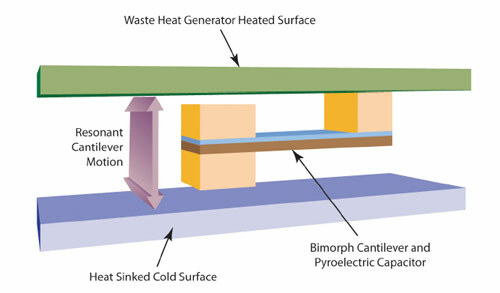 The as-of-yet unnamed thermal waste-heat converter has the potential to cool electronic devices, solar cells, and computers while generating electricity from excess heat. Its creators see the new conversion process being used to reduce the massive amounts of heat generated by petaflop computers. The converter employs up to one thousand tiny cantilevers attached to a one square inch surface (e.g. a computer chip) to produce between one and ten milliwatts of electricity -- admittedly a very small amount of energy. However, it's creators are quick to point out that a slew of these converters could generate enough power to perform small tasks in the heat-generating device -- things like sensing when a server room gets too hot for comfort. Sure it's a small step, but if they can get this stuff to save our future babies from cooking, we're all in. Full PR after the break. ORNL energy harvester turns heat waste into electricity, converts hot machines into cool customers originally appeared on Engadget on Mon, 16 May 2011 20:02:00 EDT. Please see our terms for use! of feed s.